Barnet produced one of the biggest shocks of the FA Cup third round as the non-league side knocked out Championship high-fliers Sheffield United with a 1-0 win at Bramall Lane. Shaquile Coulthirst’s first-half penalty saw the Bees eliminate a side 83 places above them in the Football League pyramid. 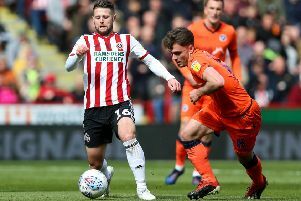 It was a particularly special occasion for Barnet caretaker boss Darren Currie, whose uncle Tony has a stand named after him at Bramall Lane after a glittering eight-year spell with the Blades from 1968-76. United boss Chris Wilder made 10 changes to his promotion-chasing side, with only defender Martin Crainie keeping his place from the win at Wigan. By contrast, Barnet were unchanged from their 1-1 Vanarama National League draw with Boreham Wood five days ago, and it quickly became apparent that their greater cohesion would cause the hosts problems. The visitors made a lively start and Jack Taylor fired wide from 20 yards as early as the fourth minute. Ephron Mason-Clark then got clear on the right, only for Richard Stearman to block his shot on goal, before Coulthirst’s header was ruled out for offside. At the other end Dan Sweeney blocked debutant Kieran Dowell’s goalbound effort, but the Bees once again produced a rapid counter-attack and Stearman had to produce a last-ditch tackle to deny Coulthirst. However, the former Wolves defender could not repeat the heroics when Mason-Clark broke free on the left after 20 minutes, with Stearman clumsily bringing down the lively 19-year-old. Coulthirst converted the penalty, although Blades keeper Simon Moore did get a hand to it. Paul Coutts fired a 25-yard volley over the bar as United sought an equaliser, but despite dominating possession for long spells, the Blades failed to work visiting goalkeeper Mark Cousins in the opening period. Barnet might have extended their lead after the break. Marvin Johnson had to deflect Mason-Clark’s low cross behind with Coulthirst lurking, and from the resulting corner Moore tipped over Callum Reynolds’ header. The following set-piece also produced a chance, with Sweeney getting the ball caught under his feet when two yards out with the ball at his mercy. The hosts finally carved out a meaningful chance after 65 minutes, but Kieron Freeman dragged his shot wide after a neat build-up involving Leon Clarke and Dowell. Substitute Billy Sharp forced Cousins into his first save of note with a shot on the turn after 68 minutes, and then turned a Freeman cross fractionally wide from three yards. United were inches from forcing a replay in the 89th minute as Cousins acrobatically turned Clarke’s header from six yards on to the crossbar after good work from Sharp down the right, but Barnet were not to be denied.